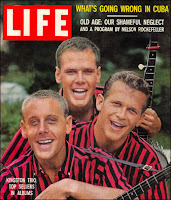 The recent death of former Kingston Trio member John Stewart at age 68 prompted me to look back on an article Rebecca and I wrote a decade ago about that hugely successful folk trio, which after a long delay was eventually published in The Guide to U.S. Popular Culture , edited by Ray & Pat Browne (Bowling Green State University Popular Press, 2001). John Stewart’s biggest solo single, “Gold,” was a Top 10 hit in 1979, but at the time I didn’t immediately associate the song with the same John Stewart who once had been a member of the Kingston Trio. Having never owned the album on which the song appeared, Bombs Away Dream Babies, only years later did I learn that it was the same John Stewart. “Tom Dooley” most certainly was one of the very first songs I remember with certainty hearing as a child, probably because it was playing constantly on the radio. The Kingston Trio was largely responsible for the “folk revival” of the late 1950s and early 60s, and while the many great folk singers who followed in their wake—Bob Dylan, Phil Ochs, Joan Baez, and Peter, Paul and Mary, among others—reacted against the largely apolitical (or perhaps politically naïve) substance of the Kingston Trio’s music, very few of those who followed them matched their immense popular and commercial success. If nothing else, the band's success taught a younger generation of folk and rock and roll artists the value of proper studio engineering, as their albums are triumphs of studio technology. According to Joel Whitburn’s The Billboard Book of Top 40 Albums (Revised & Enlarged 3rd Edition, Billboard Books, 1995), the band’s debut album, released in 1958 and containing the hit, “Tom Dooley,” spent a whopping 114 weeks on the Billboard charts. The Trio’s second album, …from the Hungry i (1959) didn’t do quite as well, spending only 47 weeks on the charts. 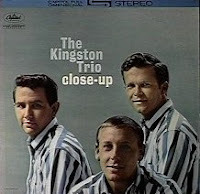 During the week of January 18, 1960 (and after), two Kingston Trio albums were on the charts simultaneously: At Large and Here We Go Again (both 1959), which spent a combined 83 weeks on the album charts, both having reached the “#1” spot and remaining there for many weeks. Kingston Trio, The (1957-1967), formed 1957 in San Francisco, originally consisted of Bob Shane (1934- ), Nick Reynolds (1933- ), and Dave Guard (1934-1991). After Guard left the singing group in 1961 and was replaced by John Stewart (1939-2008), the Trio carried on until it disbanded in 1967. In the late 1960s Bob Shane purchased the rights to the group’s name, and has continued the group since. He and Reynolds reunited in the late 1980s. During their peak popularity, from 1958 through 1964, the Trio had few rivals but many imitators (e.g., the Brothers Four, the Lettermen). The group’s first album, The Kingston Trio, was released by Capitol in June 1958. It was the single “Tom Dooley,” however, about a man hanged for murder, that cemented the group’s success, reaching the No. 1 position on Billboard’s Top 40 chart in December 1958. Although the song putatively had been discovered and performed by Frank Proffitt in the late 1920s and had also been recorded by Frank Warner on Elektra in 1952, the Kingston Trio’s version became a hit. The group’s success was so colossal that Capitol released four Trio albums within the next year alone, attempting to cash in on the exposure provided by “Tom Dooley.” At Large (1959), the group’s third LP, stayed at the No. 1 spot for 15 weeks, and is one of the best-selling folk albums of all time. It yielded another hit single, “M.T.A.,” about a man doomed forever to ride the Boston Mass Transit Authority train because he hasn’t the money to get off. During the years 1958-63 the Trio had 17 Hot 100 entries (or debuting single) and seven gold records. Close-Up, released in the fall of 1961, was the debut album by the “new” Trio, with John Stewart replacing Dave Guard. This Trio’s second single, “Where Have All the Flowers Gone?” (written by Pete Seeger), released in January 1962, became the first of many popular singles; it was followed by “One More Town,” “Greenback Dollar,” and “Reverend Mr. Black,” the latter release of 1963 being one of the group’s most successful singles behind “Tom Dooley.” Time to Think, released early in 1964, yielded the Trio’s last charting single, “Ally Ally Oxen Free,” a Rod McKuen penned tune, but the album also contained the Trio’s moving version of the Clancy Brothers’ “The Patriot Game.” The song failed to chart as a single, as did the Trio’s final single for Capitol, “Seasons in the Sun” (though it became a smash hit for Terry Jacks in early 1974). The group released one more album for Capitol, Back in Town, in May 1964, the 20th album in six years. The Trio moved to Decca in late 1964 and released four albums. According to critics, the best of these was Stay Awhile, released in May 1965. The final album, Children of the Morning, was released early in 1966; by June of 1967, the group decided to call it quits. The live album Once Upon a Time, released in 1969, consisted of material recorded in 1966. Additional information, with a more detailed discography, can be found at the group’s website. A fine article indeed - well-written, thoughtful, and heartfelt, as is your piece on Nick Reynolds. I have a variety of folk music and KT pages on Blogger, and I wrote the award-winning Wikipedia article on the group. For that, I used Whitburn's book and many others (as well as my own memories and acquaintance with Shane, Reynolds, and Stewart - I've been a fan from the first album til now) - and simply to add to your well-stated appreciation - the KTs chart success was even more phenomenal then mentioned here. In the week of 12/4/59, the KT had four albums in the top ten on Billboard at the same time, a feat never equalled before or after. That's sourced with refs in the Wiki. Following Stewart's death, I created a Blogger page memorializing John Stewart ("A Page In Memory Of John Stewart" here on Blogger) and am a bit belatedly working up a page called "Remembering Nick Reynolds" also here on Blogger. With your permission, I'd like to post a link to your articles on the Reynolds page. I intend to have a wide variety of written tributes linked there, much as I have already with Stewart. Again, I offer you a fan's thanks for your efforts to keep the KT name and fame alive. ps: you also might enjoy my Blogger home page for my own folk group, the Chilly Winds, that does a lot of KT material. We have a quarter of a million views on YouTube. Go figure.